Your Next Stamp 1st Design Team Call! Hello! When I first saw these precious images at Your Next Stamp, I knew I had to do 2 things. 2) Apply for their DT! These stamps are just the CUTEST and I would love the opportunity to work with them! Here are the two cards I made for my submission. Is she not adorable!?! This sweet little mermaid is from the Happy Days Mermaid set. I stamped her with Memento Tuxedo Black and colored her with Copics. I cut her out and added some Stickles to her scales and fin : ) I did the same with the starfish. I thought it would be cute to add little pearls for her earrings, and I also cut out the flower in her hair so I could pop it up. I added some bubbles to my oval with the Tiny Bubbles CB Folder. The dp is from SU Tea Party DSP. To finish off the card I added a machine stitch around the perimeter, Dew Drops in the right corner, and the ribbon. This set comes with so many cute sentiments, and little sea creatures, so this is how I finished off the inside. I LOVE baby cards, and I couldn't resist this darling stamp called Baby Boy Clothes Out To Dry. I stamped the image with Memento Tuxedo Black, and colored with Copics. I cut it out with square Nestabilities, and sponged around the image with SU Soft Sky ink. I used dp from K&Company Small Wonders Boy and the sentiment is from SU Short & Sweet. I added a machine stitch around the perimeter once again and put brads in the corners for a little interest. The ribbon and scalloped border finish it off! I will leave a complete recipe for both cards below : ) Thank you so much for stopping by today, and please wish me luck!!! These are just so adorable, Kerri! They would be crazy not to choose you for their DT!! Good luck, girlie!! Kerri these are fabulous! You're the first person to use our stamps for the DT Call and I LOVE them both! OH MY Kerri this is soooo CUTE!!! Holy moly girl this is ADORABLE!!! I just love these images too, aren't they soooo cute!!! I wish you the BEST of luck girl, you got this sweetie...love your card!!! Geez Kerri ~ These images are too cute! Of course your design around the images makes them even more special...keep in touch, I miss you girls!! Look at you applying for work all over town! These cards are super....love the colors on the baby card. Your coloring is always fantastic like on the little mermaid. Good luck! These cards turned out great. I love the baby one, the soft blue sky you made, and your coloring is gorgeous. That mermaid is SO cute! I love the little embossed section, the pearls for earring, and the dew drops in the corner. Good luck with the DT application. Your stuff is always fabulous. 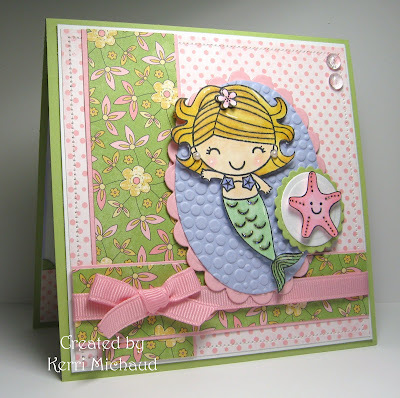 Fabulous cards, Kerri! Good Luck with the DT application! They will like your work! You are very talented! These are both SO adorable! I can't wait to get my stamps so I can play too! Good luck with the DT call! Both these cards are totally adorable! Great job and good luck, girl!